At WWDC, Apple reported that they’ve paid out $70 billion to developers, with 30% of that ($21 billion!) in the last year. That’s a huge spike, and surprising to me because it didn’t seem like my friends and I were spending more on apps last year. But that’s anecdotal, so I wondered: Where are these revenues coming from? I opened App Store to browse the top grossing apps. I scrolled down the list in the Productivity category and saw apps from well-known companies like Dropbox, Evernote, and Microsoft. That was to be expected. But what’s this? 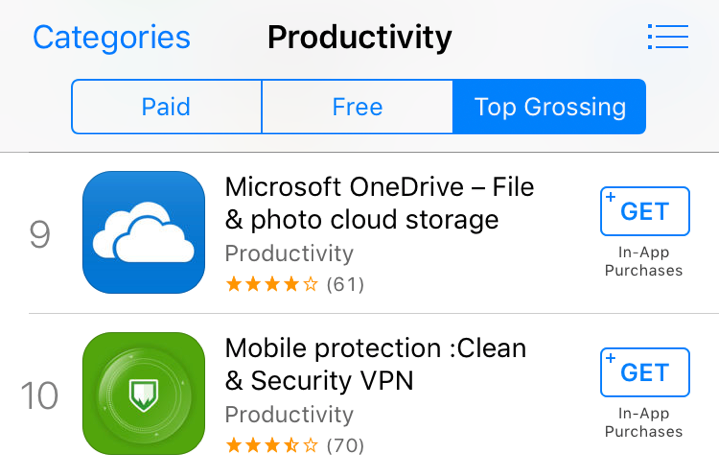 The #10 Top Grossing Productivity app (as of June 7th, 2017) was an app called “Mobile protection :Clean & Security VPN”. Given the terrible title of this app (inconsistent capitalization, misplaced colon, and grammatically nonsensical “Clean & Security VPN?”), I was sure this was a bug in the rankings algorithm. So I check Sensor Tower for an estimate of the app’s revenue, which showed… $80,000 per month?? That couldn’t possibly be right. Now I was really curious. I tap into the app details to see that the developer is “Ngan Vo Thi Thuy”. Wait so, this is a VPN service offered by an independent developer who didn’t even bother to incorporate a company? That’s a huge red flag. For those of you who don’t know why this is bad, a VPN basically routes all your internet traffic through a third party server. So in this case, a random person who couldn’t piece together a grammatically correct title, who also didn’t bother to incorporate a company, wants access to all your internet traffic. Direct screenshot from the “Mobile protection :Clean & Security VPN” app description. 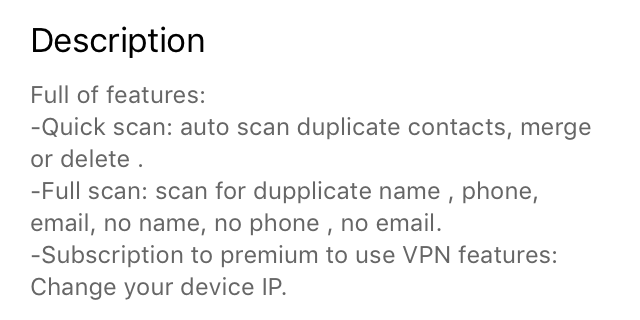 According to this, “Mobile protection :Clean & Security VPN” is “Full of features” — well, it’s certainly full of something. Apparently, “Mobile protection” includes protecting you from “dupplicate” contacts. And these “scans” are what the screenshots claim as “Quick & Full Scan Internet Security”. Five internets to anyone who can figure out the relationship between Internet Security and duplicate contacts. Seeing the dates on these reviews brought up another question. How long has this app been up? Well, according to Sensor Tower, “Mobile protection :Clean & Security VPN” has been a top 20 grossing Productivity app since at least April 20th (almost 2 months now). Yes, “This app need to cccess to your Contact to scan your Contact first.” The only option here is to tap Agree, and then iOS asks me if I want to give this app “cccess” to my contacts. Uhm, no thank you? 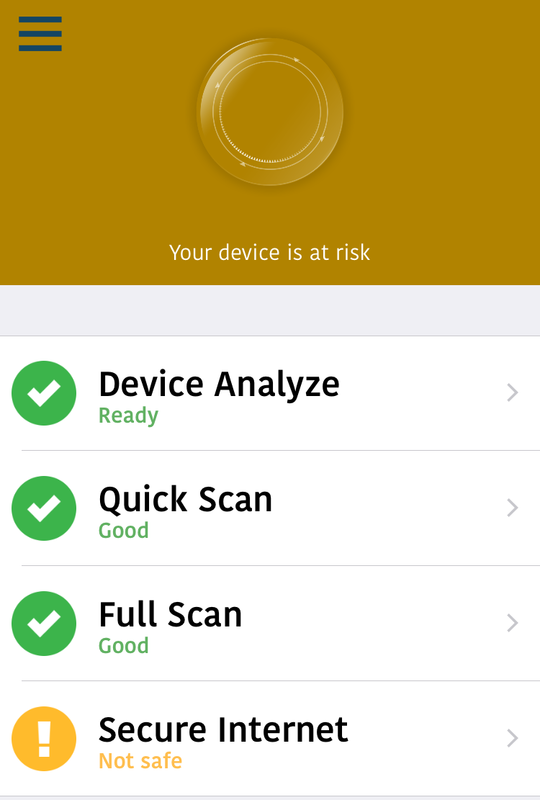 After skipping that, the app tells me my device is at risk. Of course it is. It‘s also ready to “Device Analyze”, Quick and Full Scan, and secure my internet (I can’t wait!). Tapping “Device Analyze” shows my iPhone’s free memory and storage — a useless and irrelevant feature. Okay, so let me finally secure my internet by tapping “Secure Internet”. Hmm, what’s this—? play WITHOUT installing? oh boy! 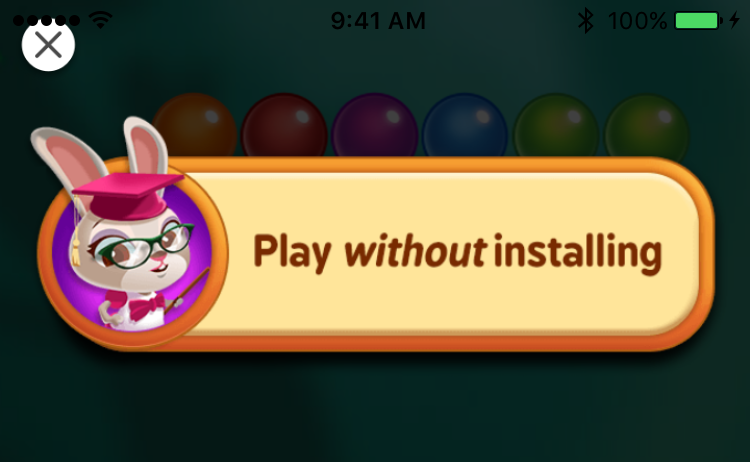 Up comes this incredibly generous offer to play a bubble shooter game without installing! Not sure what I did to deserve this amazing free gift, but it will have to wait. I tap the “X” to return to securing my internet. Such generous. Much design. Very scam. 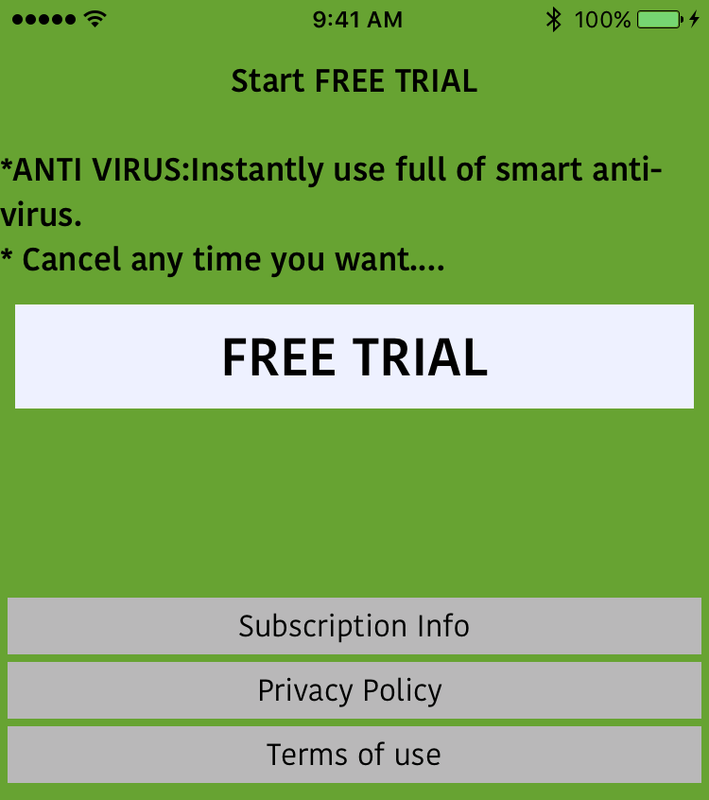 And obviously, I jump at the opportunity to “Instantly use full of smart anti-virus” by tapping “FREE TRIAL”. It’s free, after all. Buried on the third line in a paragraph of text in small font, iOS casually tells me that laying my finger on the home button means I agree to start a $100 subscription. And not only that, but it’s $100 PER WEEK? I was one Touch ID away from a $400 A MONTH subscription to reroute all my internet traffic to a scammer? I guess I was lucky I actually read the entire fine print. But what about other people? It suddenly made a lot of sense how this app generates $80,000 a month. At $400/month per subscriber, it only needs to scam 200 people to make $80,000/month, or $960,000 a year. Of that amount, Apple takes 30%, or $288,000 — from just this one app. Maybe you wouldn’t download it. I certainly wouldn’t. But I’ve also never clicked on a Google Ad, yet Google somehow rode Adwords to $700 billion dollars today. “Mobile protection :Clean & Security VPN” is currently ranked #144 in most downloaded free productivity apps in the App Store, with an estimated 50,000 downloads in April. To get 200 subscribers from 50,000 downloads, they just need to convert 0.4% to purchases — or maybe even fewer, because these subscriptions are automatically renewing, so the subscribers stack month over month. 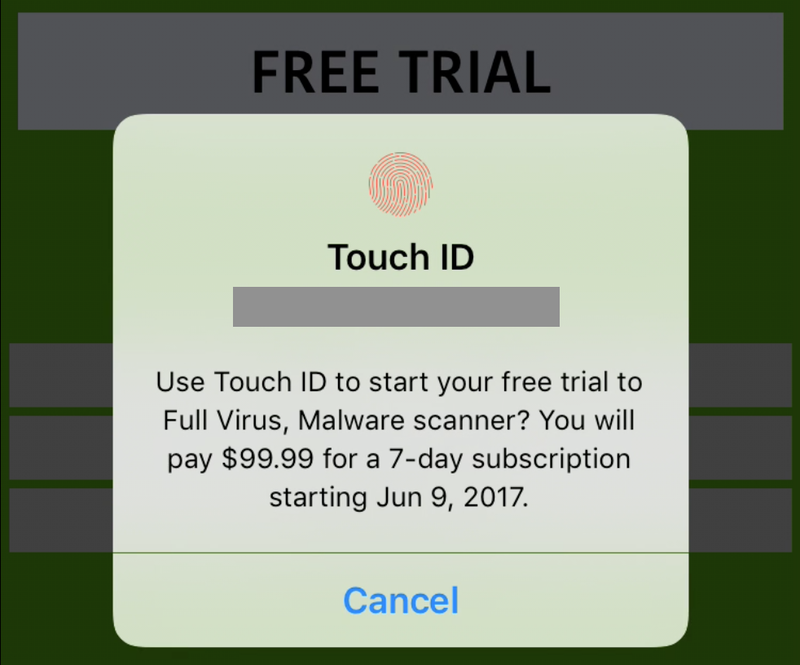 Can you really not imagine one of your tech-illiterate relatives accidentally (or even intentionally) subscribing to this “free trial” to protect their iPad from viruses? But how did this app get 50,000 downloads in the first place? 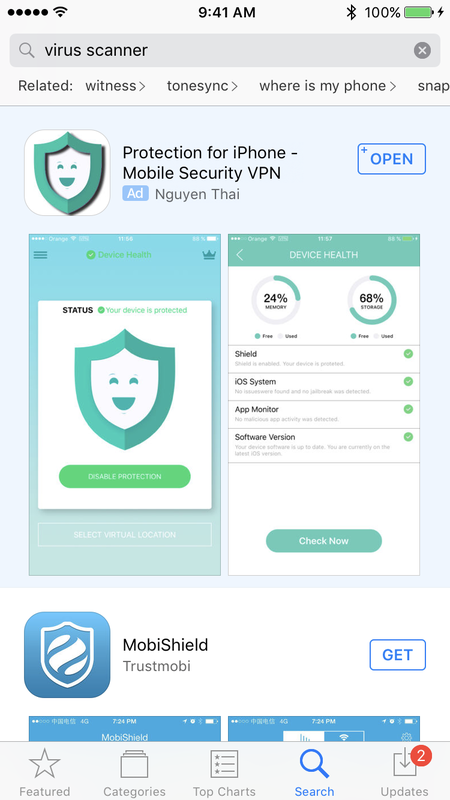 The first result is an ad for “Protection for iPhone — Mobile Security VPN”. Well, that sounds familiar. This isn’t the same app, but this one’s In-App Purchase is “Free Trial to Premium Protection” for $99.99, and it’s ranked #33 for Top Grossing in the Business category. Turns out, scammers are abusing Apple’s relatively new and immature App Store Search Ads product. They’re taking advantage of the fact that there’s no filtering or approval process for ads, and that ads look almost indistinguishable from real results, and some ads take up the entire search result’s first page. 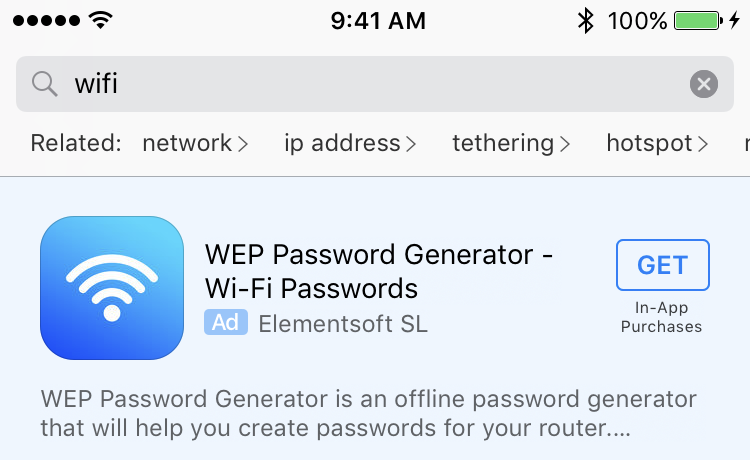 The top result is an ad for “WEP Password Generator”, a simple random string generator that charges $50/month. It’s already making $10,000 per month, despite being released in April. It’s likely a clone of this app, which indicates that yes, this scheme has become so large that scammers are copying each other. Teach your less tech-savvy friends and relatives how to check and disable subscriptions. If they’re affected, have them get refunds. Report scam apps when you see them with the iTunes Connect Contact Us form. Select “Feedback and Concerns” and “Report a Fraud Concern”. Signal boost until Apple fixes this by clicking the heart icon (“Recommend”) at the bottom of this article, and by sharing to FB/Twitter. Remove Scams and Refund Users: The most obvious. Simply hire someone to proactively and regularly scroll through top apps and remove scams. As you can tell from above, these are not hard to spot at all. And for people who have purchased scam subscriptions, automatically and fully refund all of those past purchases. Better UI on Touch ID Subscriptions: Don’t use small, fine print with the price buried in the text (see “Free Trial” screenshot above). The price should be much more prominent, with possibly a required 5-second delay before a purchase can be made. As a bonus, maybe show the app’s most useful/recent ratings or reviews here. Stricter Review of Subscriptions: How do in-app purchases called “Full Virus, Malware Scanner” get approved by app review for $400 per month? Is anyone home? When a layperson sees this name in an email receipt with a slick green badge icon, they probably don’t cancel it because it looks as official as their Apple Music receipts. And for some apps like this one, despite its in-app purchase being named “Free Trial to Premium”, it wasn’t a trial at all — it was an immediate purchase. Prompt for Delete Subscription on App Deletion: Many 1-star reviewers on scam apps said they were getting charged even though they deleted the app. To most people, that’s the way it should work — so why doesn’t it work that way? When a user deletes an app, ask the user if they want to also cancel their subscription. Of course, confirm it again so they don’t accidentally cancel their Netflix. Fraud- and Abuse-Proof Search Ads: Part of what makes this scam easy to run is the how new Store Search Ads are. Many regular users probably don’t even know they’re clicking an ad. At the least, Apple should review ads for potential fraud before running them (Facebook and Google both do this), and make it more obvious that the top result is an ad. Fine and Take Legal Action: This suggestion is last because it’s unlikely Apple will do it. There’s currently no incentive not to build scam apps. The worst that can happen is getting your account deleted — which doesn’t matter, because you still keep the ill-gotten profits, and you can still make a new account and do it again. Create a deterrent effect by fining and taking legal action against the worst offenders. App developers take pride in the fact that if their creation adds value, or improves peoples’ lives in some way, then people will be happy to pay for it, and everybody benefits. Not only that, but making good apps requires design, engineering, and sales skills, as well as a ton of dedication and hard work. So, aside from the obvious moral wrongs of exploiting the vulnerable for profit, it’s extremely disheartening to know that some developers are becoming financially successful the easy and unethical way — by making bogus apps that take a few hours to code, and whose functionality is purely to steal from the less well-informed. If anyone at Apple is reading this, please do the right thing. And for the rest, click the heart icon (“Recommend”) below to signal boost until this is fixed. P.S. After writing this article, we created a way for apps and services to earn user trust through transparency. It’s a new standard called Openly Operated, and we built a real privacy/security product around it to show that it works.